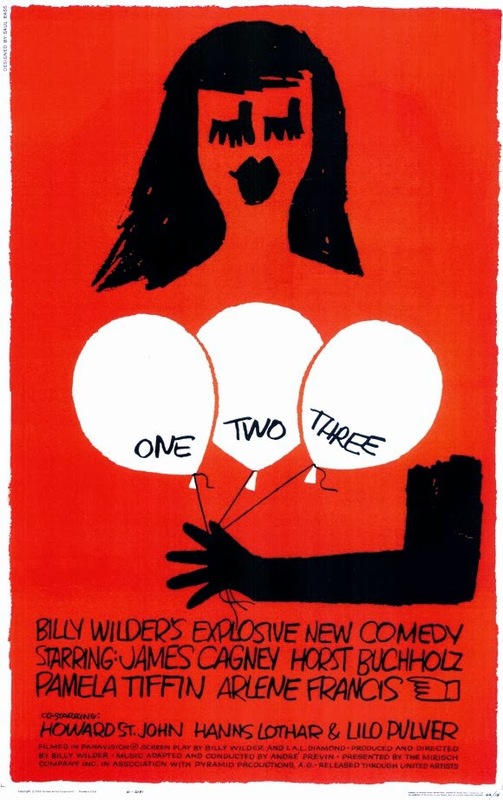 Tag line: "Billy Wilder's Explosive New Comedy"
In 1981, James Cagney broke his 20-year retirement from the big screen to play Police Commissioner Rhinelander Waldo in Milos Forman’s underrated epic, Ragtime. Prior to that, his last appearance had been in Billy Wilder’s 1961 comedy, One, Two, Three, the frantic, often hilarious story of a Coca-Cola executive stationed in West Berlin who gets more than he bargained for when he agrees to watch over the boss’s daughter during her stay in Germany. Cagney is J.P. MacNamera (aka “Mac”), a dedicated employee who’s knee-deep in negotiations with the Russians, trying to introduce Coca-Cola to that country, when he gets the call from his boss, W.P. Hazeltine (Howard St. John), asking him to keep an eye on his pretty but none-too-bright daughter, Scarlett (Pamela Tiffin). Hoping to be promoted to head of operations for all of Western Europe, Mac reluctantly agrees to put the girl up in his house, causing even more friction between him and his wife, Phyllis (Arlene Francis), who desperately wants to move back to America. When Scarlett’s planned 2-week vacation turns into 2 months, Mac thinks she simply likes Berlin, but the truth of the matter is she’s fallen in love with Otto Piffl (Horst Buchholz), an East German Communist. What’s more, the two were secretly married! With Scarlett’s parents set to arrive the next day to take her home, Mac does everything he can to break the happy couple up, only to learn that Scarlett is also pregnant with Otto’s child. His dreams of a promotion fading fast, Mac tries to salvage the situation by transforming the anti-capitalist Otto into the type of man a wealthy southern executive would be proud to call his son-in-law. One, Two, Three is a wild movie, a fast-paced comedy that rarely stops to take a breath, with James Cagney delivering what might be the most frenzied performance of his career. Before Scarlett’s arrival, his Mac is a go-getter, launching the Russian negotiations before clearing them with the front office in Atlanta. He has a beautiful secretary (Lilo Pulver), with whom he’s having an affair, and sales of Coke in Berlin have skyrocketed since his arrival. In short, everything is going according to plan, and he works hard to ensure it stays that way. Even when faced with the “Scarlett dilemma”, Mac never loses his resolve, dedicating all his energy to turn this near-calamity into an opportunity. Despite the fact he was over 60 at the time, Cagney is a veritable human dynamo throughout One, Two, Three, shouting his lines and keeping up with the chaotic pace that Wilder establishes early on. The supporting cast is fine (especially Buchholz as the antagonistic Otto), but from start to finish, One, Two, Three is the James Cagney show.